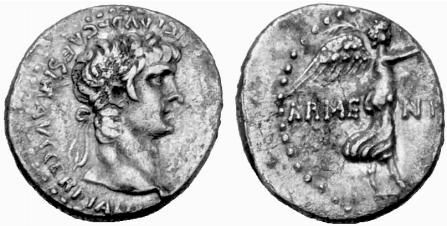 Hemidrachm, struck 59-60(?) AD in Caesarea (Cappadocia). Obv. : NERO CLAVD DIVI F CAESAR AVG GERMANI, Nero head, laur., r. Rev. : ARME-NIAC, Victory advancing r., r. holding wreath, l. palm.